The nest looked a bit weak and the female is extremely skittish, flying away even when I approach the window, so I wanted to get a look at what was going on up there above my head. Was she even sitting on eggs? Hmm. One of these things is not like the others. 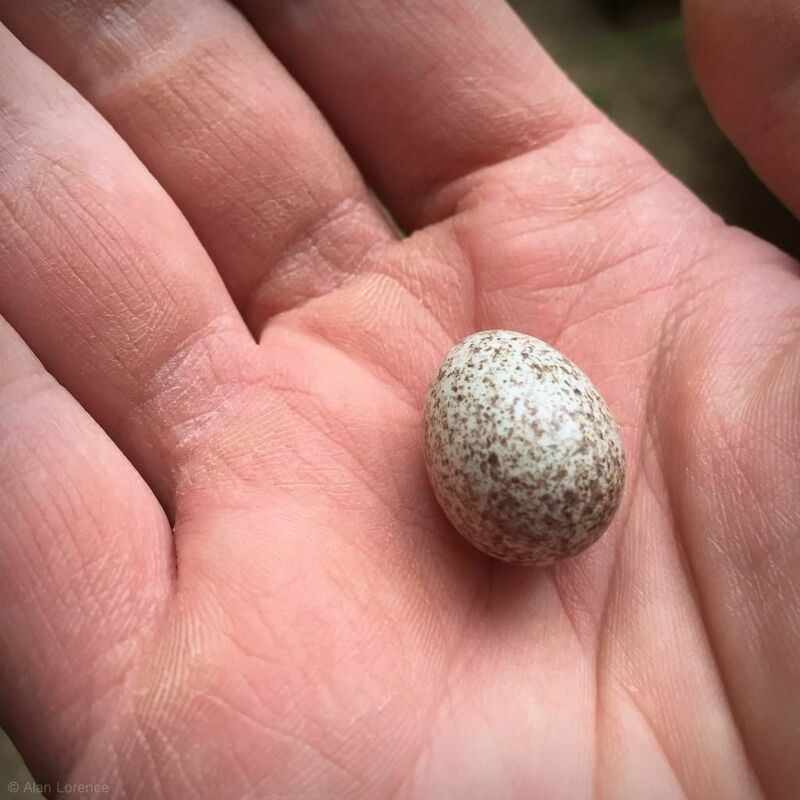 Cowbird egg! 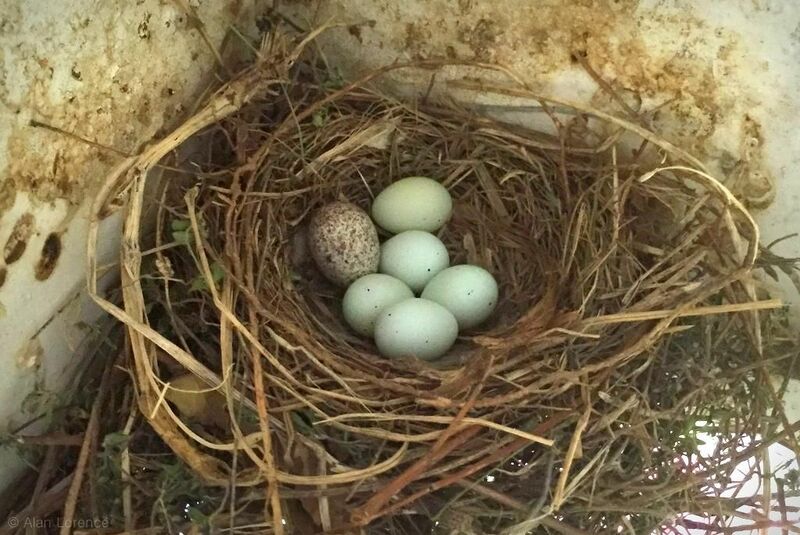 After doing some reading about cowbird eggs and chicks, I decided that this egg most likely meant the death of the five house finch chicks. 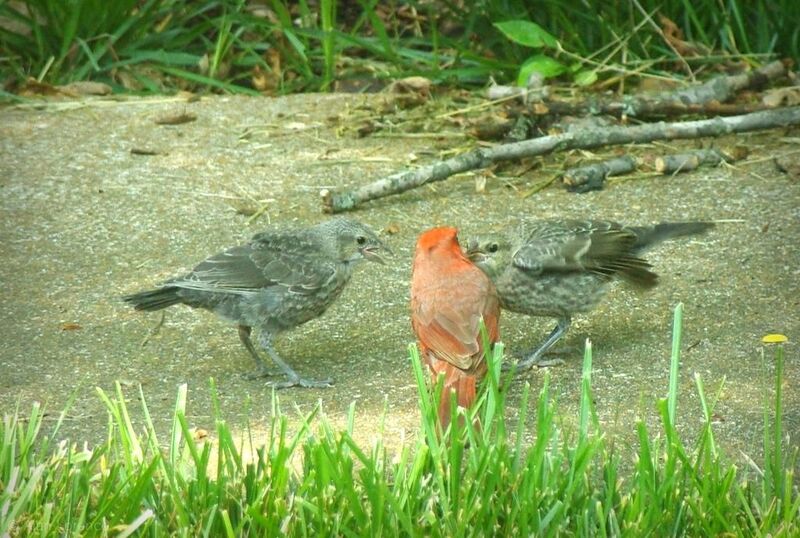 The cowbird chick wouldn't kill them outright, but since it hatches earlier and is much larger it would dominate for its adopted parents' attention, and the other chicks would not likely survive. ...which lead weight to this theory that the other chicks probably would not survive. ...and removed the cowbird egg from the nest. I felt quite guilty about condemning this unhatched chick to death, but to save the other five it was worth it. Besides, Nature itself is quite cruel as I've seen for myself time and time again, so I didn't feel too down about it. I was concerned for a while that the the mom might not return to the nest, but she was back up there later. Whew. I did not expect to be making this type of rescue! Glad you spotted the deception, good move! Someone told me that cowbirds wouldn't survive in a finch nest because they need protein (and finches feed their hatchlings nothing but plants). I wonder why cowbirds have developed this strategy? I would have made the same decision in favor of the house finches but would have felt the same guilt. Maywyn, please post here. I did not receive an email and everybody could probably benefit from your comment. I was also going to say "good for you", but now I too, am curious! In Sweden, the cowbird equivalent is the cuckoo, who does the exact same thing. Birds are so interesting, and I know so very little about them. It looks from what I read, its illegal to remove cowbird eggs under the Migratory Bird Treaty. I am glad that you helped the house finches the way you did. They are such sweet little birds. It is a joy to see the mama and papa house finches choosing their nesting place, hopping and twittering all the while. The papa finch sings so beautifully, too. Interesting information about cowbird's nesting habits. And although we shouldn't get involved in nature, I would have done exactly the same as you. Lets hope that cowbird isn't going to be vindictive. Enjoying your Blog. Still looking...have a great day.